It’s one of those travelling truths that whenever you want to properly get to know a city, you need to find and experience a number of its different personalities. This is even more important when you are in a city that is at least 500 years old. I think that, with today’s packed itinerary, I have gotten to know a few of the many sides of Kraków. 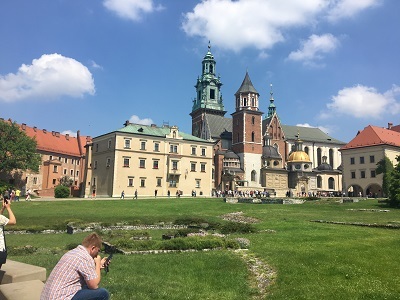 After a small breakfast at the hotel, composed of a bunch of things we found in the local Carrefour Express, we made a beeline straight for the second of the four Lonely Planet sites that I plan to see whilst in Kraków. It’s located at the southern tip of the old town and is at the top of Wawel Hill, overlooking the city and the river. The whole complex is huge and also contains Wawel Cathedral (more on that later). Now if there is one piece of advice that I want to pass on, because no one told me, it’s this: do not buy your tickets from the ticket office on the slope – instead head inside and buy it at the ticket office near the tower. Why? More open windows, it’s inside away from the blazing sunshine and the visitors come in ones and twos rather than large groups buying conflicting tickets. We wasted nearly an hour because we did not know this, so you are welcome. I can see how people can spend pretty much an entire day here. 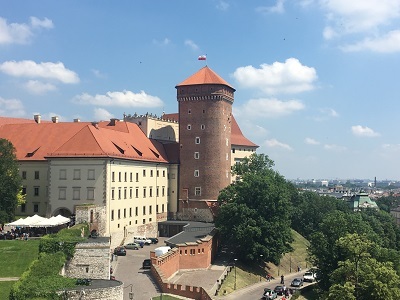 There are plenty of things to see, do and eat – all at the typically inexpensive Kraków prices (I mean 3zl for a scoop of ice cream in a castle café is loving the Kraków dream). Since we had no desire to be led around by the nose, we went for most of the things that did not require a guided tour (except the Oriental art exhibition, because timing and money). For good views of the surrounding city, you’ll want to pay a visit to the Sandomierska Tower (and for 4zl it’s a bargain) – but that’s hardly one of the big ticket items here. For that you’ll want to head to the State Rooms, houses a large number of tapestries, paintings and come of the most interesting ceiling work that I have seen in a European stately home. It’s a real shame that, throughout the castle complex, they are militantly anti-camera – otherwise I’d have posted a picture of one the weirdest ceilings I ever saw (imagine a bunch of heads peering down at you and you’ll get an idea). This trip around the State Rooms really made me wish I knew more about Polish history before coming to Kraków (aside from the story of St Hedwig and her many water glasses). At least today I’ve managed to pick up a few stories about King Stephen Bathory and some of the other monarchs that came before him. After the State Room was a visit to the ‘Lost Wawel’ exhibition that contains archeological remnants from excavations. 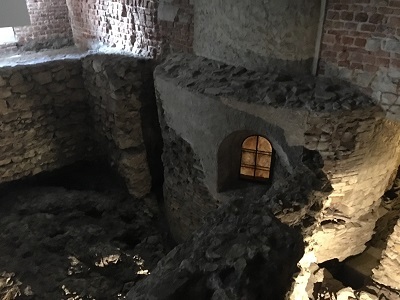 This is fine enough, but the real point of interest is near the end where you descend down a ramp and see parts of the first church built on Wawel Hill, which dates to around 1000 AD. Utterly astonishing and so well preserved considering how much restoration work is having to be done on other areas of the castle. 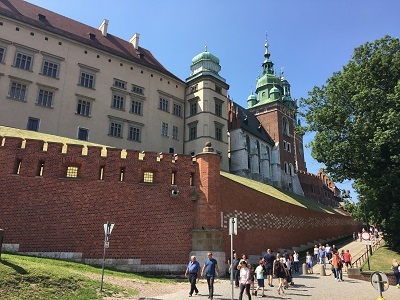 Before leaving the hill, you have to pay a visit to Wawel Cathedral. The ticket includes a trip around the cathedral itself, a bell tower (where you get to see the heaviest bell in Poland) and the royal tombs (which lacked the grandeur of Vienna’s Habsburg coffins, but were still good to see). The interior of the cathedral itself is a real mix of different styles with a large number of chapels to different saints – the largest being to St Hedwig herself. Again, wish I could have taken pictures. We left the castle via the Dragon’s Den, which is a small limestone cave that is the best way to exit. 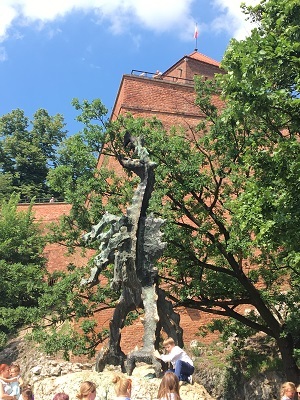 It’s one of the most famous caves in Poland because it is attached to the myth of the Wawel dragon… which explains all the dragon paraphernalia in the Kraków souvenir shops. It was already getting to the mid-to-late afternoon so it was time to march on to Kazimierz (aka the Jewish Quarter) and pick up some lunch along the way. 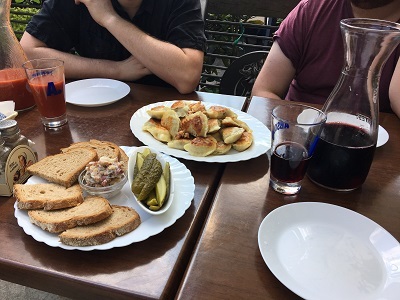 We ended up in a pub-restaurant en route and, between us, had a pile of three types of pierogi (meat, cabbage and Russian) and a plate of bread, lard and pickles. Honestly I am falling more and more in love with the food in this city/country plus any restaurant that allows three guys to order a carafe each filled with different fruit juices (mine was blackcurrant) is alright by me. Also, these pierogi and that lard was delicious. Hopefully I can find more of this before I leave for London. We roamed the Jewish Quarter for a bit before reaching the Galicia Jewish Museum. 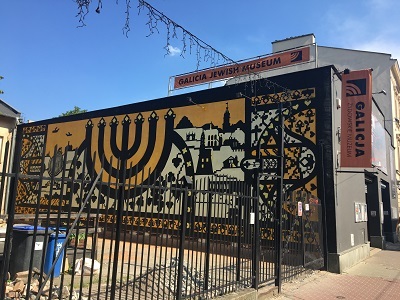 It’s not that big, but it houses some really interesting photographic exhibition is about Jewish life in the Galicia region (which included Kraków) pre and post Holocaust. The photographs and the initial exhibition about the importance of blood in Jewish lore really helped open my eyes and my heart in preparation for tomorrow’s devastating visit to Auschwitz. I’d really recommend the Galicia Jewish Museum if you need a bit more context of you need a bit of a history lesson about how Jews were seen in Europe before the Holocaust happened. 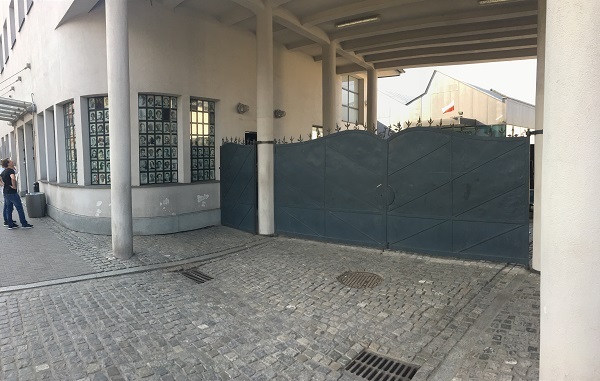 From here the idea was to pay a visit to the Oskar Schindler factory, but they had sold out of tickets by the time we got there – so we stared at the outside before slowly making our way back to the Old Town. After all, I booked us tickets to a concert. 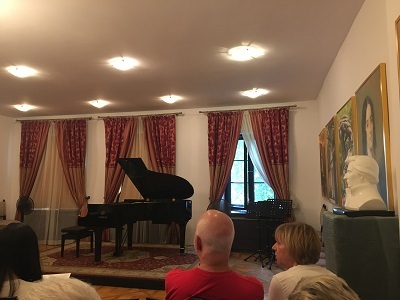 Despite having nothing to do with the city of Kraków, there is an hour long Chopin concert every day at 7pm for the low price of 60zl (which comes with a free glass of sparkling wine). It starts with a short talk about the life of Chopin before moving into an hour long recital of a number of Chopin pieces – including some mazurkas, a nocturne, a waltz (which was mesmerising) and enough of his ballades for me to consider is crossed off. Aside from loud Italians in front of us, the experience of seeing a piano virtuoso playing these pieces live completely beats listening to them via headphones. It’s utterly breathtaking to see someone with so much talent and has worked so hard to learn this skill. He was also easy on the eyes, which helped to make the waltz he played just that extra bit dreamy. After this was dinner at a steakhouse across the road called Ed Red. 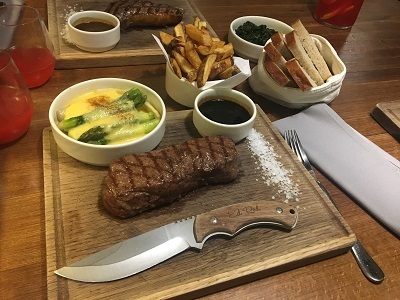 It’s one of the higher rated restaurants in Kraków and sometimes you just want to have steak. It also helps that it had two food items on the menu. I’m really getting through the offal at the moment aren’t I. Since I didn’t want two starters to myself, I managed to convince my husband to order the plate of assorted veal offal whilst I order the ‘mountain oyster’ for myself. Just to start off, this ‘oyster’ was served with a smoked white chocolate sauce – which may be one of the more unusual and delicious sauces that I have ever had. It really went well with the ‘oyster’ which was surprisingly delicious. I has expected something more chewy and gelatinous, when it was actually very delicate and tender with a vaguely beefy taste. It’s a bit like if leberkase contained puréed steak alongside the pork. At least that’s what I think. It’s weird to say this, but I would happily have bull testicle again in the future. 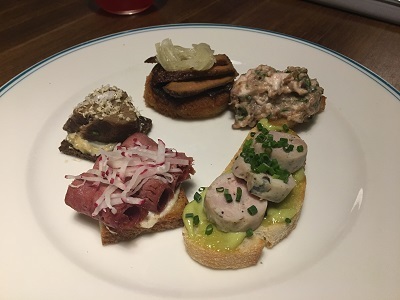 On my husbands plate was veal sweetbreads (which is thymus gland or pancreas), brain, tongue, cheek and liver. First and foremost, the veal brain was so much nicer than the lamb brain that we had because it had been seasoned really well. 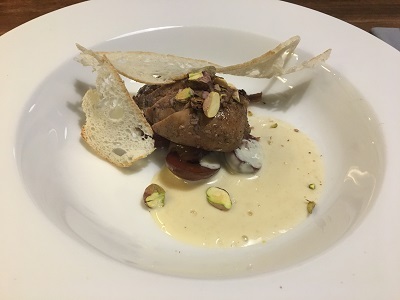 But that’s by the by – the best veal offal on the plate was the sweetbread. It was like eating a very subtly flavoured white sausage that took on the flavour of the mustard underneath it. It’s one of those pieces of offal that I have been very curious to try it with different sauces. As a main we all had some excellent Polish sirloin steak with a a number of different side dishes in the middle. For the price of the whole dinner (£24 each) we had some really good food and tried some really interesting things. If I am ever in Warsaw, I might have to hit up the other Ed Red location. So tomorrow is going to be a trip to Auschwitz. It’s a long return journey and it’s looking to be a harrowing day. 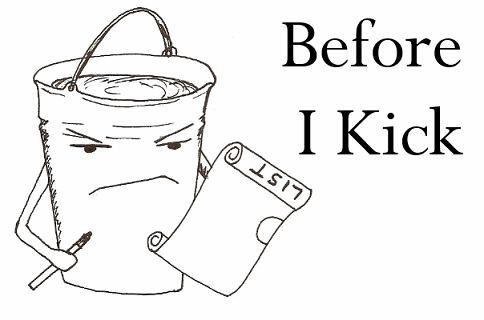 Will podcasts for the bus journey and a good meal take the sting out of it? Who knows, I guess I’ll just find out tomorrow.